This 9 Days Uganda gorilla safari Bwindi, Mgahinga golden monkey trekking safari tour & wildlife safari will begin and end in Kampala. This trip in Uganda is the most exciting Uganda safari a tourist can ever choose to take. It is tailored to suit memories and adventurous activities that are very rewarding and exciting. On this 9 days Safari in Uganda, you will visit the Lake Mburo National Park and Queen Elizabeth National Park for your Uganda wildlife safari Uganda, tour Bwindi Impenetrable National Park for a Uganda gorilla safari tour in the forest. As part of your adventure, you will take a boat cruise on Lake Mburo, Lake Bunyonyi, and Kazinga channel found in Queen Elizabeth National Park. You will travel in a 4×4 safari Van, 4×4 safari minivan, 4×4 safari land cruiser or 4×4 coaster depending on the number of people coming for this safari. Your accommodation during these days will depend on your choice ranging from luxury, mid-range and budget. Day 2 of the 9 Days Uganda gorilla safari Bwindi, Mgahinga golden monkey trekking safari tour & wildlife safari: Do a game drives in Lake Mburo National Park. 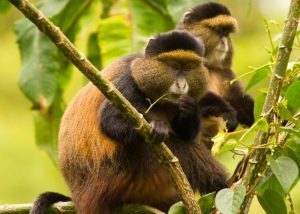 Day 3 of the 9 Days Uganda gorilla safari Bwindi, Mgahinga golden monkey trekking safari tour & wildlife safari: Do an early morning game drive as you depart the park for Mgahinga National park. Day 5 of the 9 Days Uganda gorilla safari Bwindi, Mgahinga golden monkey trekking safari tour & wildlife safari: Transfer from Mgahinga National Park to Bwindi Impenetrable national park. Day 7 of the 9 Days Uganda gorilla safari Bwindi, Mgahinga golden monkey trekking safari tour & wildlife safari: Transfer to Queen Elizabeth National Park. 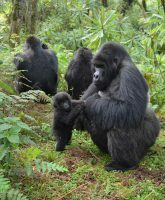 Day 9 of the 9 Days Uganda gorilla safari Bwindi, Mgahinga golden monkey trekking safari tour & wildlife safari: Transfer back to Kampala.